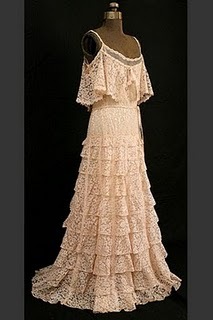 During the 17th and 18th centuries lace was a sign of prestige and wealth. Could that be why we are still obsessed with the look of lace? Some ladies think that wearing lace can only mean that you are getting ready for a special event. We relate lace to wedding dresses, party dresses and such, but now lace is incorporated in accessories, knit tops, and even jeans! Here are a few examples of lovely lace infused designs that made me look twice. 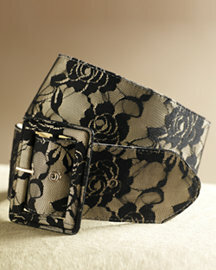 For just a hint of lace try it on a belt. It will add instant femininity.....and an instant waistline. I have a feeling that this is going to be a necessary piece for wardrobe. Worn with jeans, black trousers, or a black pencil skirt, this is a piece that I can see myself wearing for years to come! A couture gown by Chanel from 1937. I am DYING. Too stunning... I have no words for this! I am speechless!